Born in Springfield, MA. Garrett graduated from the University of Massachusetts with a Bachelor of Fine Arts. He has also studied at Exeter College of Art & Design in England with painting excursions in London, Edinburgh, Belfast and throughout the Southwest-Devonshire region. Two additional years at Springfield College for educational coursework resulted in teacher certification and computer animation experience. As a fine artist and muralist, Garrett's key objective with most painting projects is to create a powerful image encompassing the elements of subject matter (architecture, landscape, figurative, collage) and the artist's ability to visually orchestrate color, light source, pattern, structure and balance. Garrett moved his studio to the small upstate village of Henderson just on the edge of Lake Ontario. He recently acquired an old wooden clapboard former Baptist Church built in 1850. After 1910, it became home to the order of Free Masons who boarded up the windows and held their secretive meetings until the 1970's. The one ton bell remains in the tower - cast in Troy New York 1852. 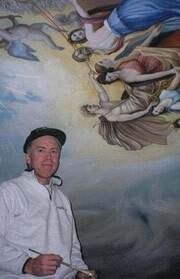 Garrett painting a baroque-style mural on the ceiling of a private home.